Copenhagenize.com - Bicycle Urbanism by Design: Bike Meets Train. Falls in Love. Bike Meets Train. Falls in Love. Bike Meets Train. Falls in Love., originally uploaded by [Zakkaliciousness]. If you're travelling distances a bit longer than you'd like to cycle, or you have a flat or it's raining, you can always take your bike on the trains. The InterCity trains and the Regional trains all have bike carriages and the Metro allows bikes, but it is on the local S-tog trains serving the Greater Copenhagen metropolitan area that is it easiest. Every train has a couple of spacious carriages for bikes and prams. 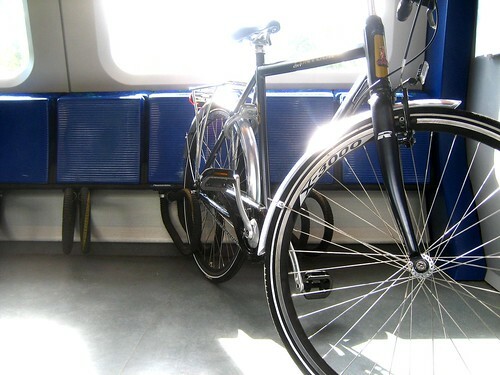 The bike racks are sturdy and flexible, allowing for the sway of the train. Just stick your back wheel in and sit down and enjoy a good book or newspaper. You need a ticket for the bike, which costs about 10 kroner. I'm still waiting to get a shot of a Copenhagen taxi with a bike rack. All taxis are equipped with a bike rack with room for two bikes. Stay tuned. tags: "bike culture", "bike infrastructure", "bike racks", "bikes on trains"